Fine spring days have me clipping and raking in the garden. When the weather starts to warm we tend to clean up our homes inside and out, putting winter past us and readying our “nests” for a new season. Outside this is not so much a chore for me, but a pleasurable activity as I am also looking for signs of rejuvenation. As we garden at Seatuck it is heartening to discover leaves of blue-eyed grass emerging through grass straw in the meadow, to find the delicately lobed leaves of columbine and inflated pads of prickly pear. All the while we are cheered by the song of pine warblers, a chorus of spring peepers and the occasional plaintiff call of an osprey. At home amongst the gaudy blooms of a forsythia bush I find a bird’s nest from a season past. I examine it closely trying to work out what material had been plucked from my garden and expertly manipulated into this exquisite temporary refuge. It is a loosely woven structure of tiny twigs, fine strands of what looks like shredded bark and some spent flower stalks from hydrangea. I try to imagine which bird it was that had raised it’s young under leafy cover so close to where I park the car. This thought has me looking up at the trees searching for knotholes and cavities and a glimpse of woodpeckers, nuthatches and titmice building their nests. I have already spied a downy woodpecker popping into one of the larger nest boxes and I have noticed that the entrance of another box is now plugged with a wad of grey fur entangled with plant fiber. Perhaps a claim for territory before the house wren returns in May? Nesting season has surely begun! Late winter Nor’easters bringing snow cannot stop this primeval urge to procreate in spring. I can see a squirrel’s drey of brown leaves up in the crotch of an oak tree. I remember when this was under construction early last fall as I was often bombarded with falling twigs still bearing their leaves. Squirrels’ nests are lined with moss, grass and shredded bark and are more elaborate than they may seem, engineered with entrance holes and escape routes. So high up, they must also be sturdy enough to withstand winter’s storms. My rake disturbs an awakening bee and I gingerly replace its cover of dried leaves. The warming air temperature has brought out some other insects and tiny bees are about searching for early sources of pollen. Maples are beginning to blush against the blue sky. Their deep red flowers offer sustenance for mining bees, which have already started building nests. 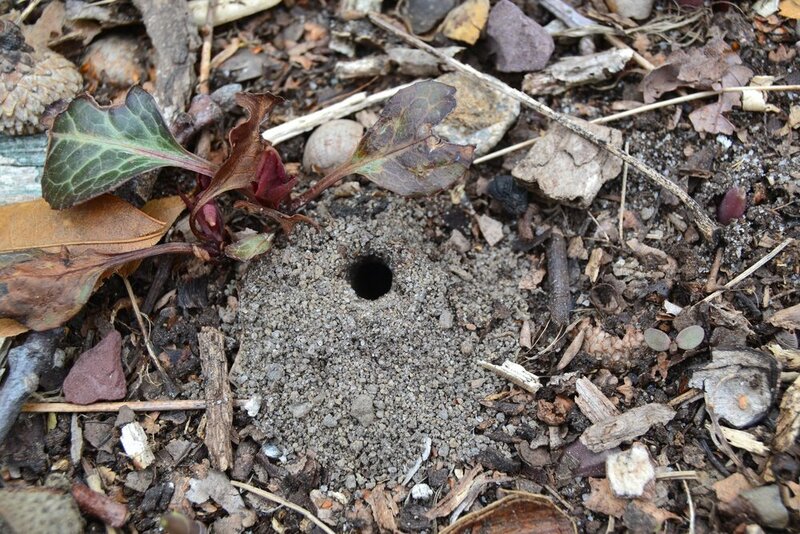 Now is the time to look for their mounded holes in bare ground, especially in the lawn of the terrace garden at Scully. Some of the dried plant material in the meadow might already be home to broods of bee from last season and shelter for hibernating insects. I am always careful to cut off not too much stalk. Indeed we use trimmed stalks from hollow-stemmed Joe Pye weed to replenish nesting material in the Seatuck Insect Hotel. I carry armloads of winter’s debris to a back corner of my yard. Leaf litter to make rich humus to feed the soil, grass straw as mulch for my vegetable bed. 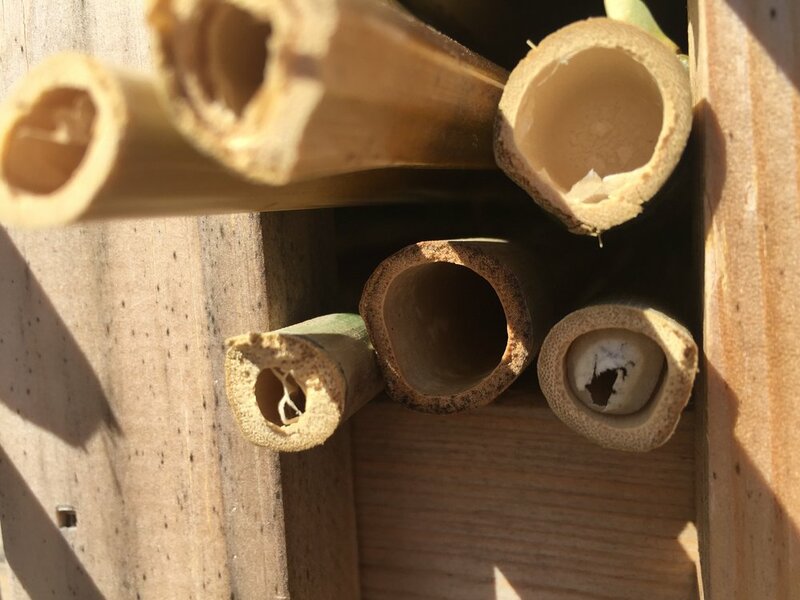 Hollow plant stalks, grass straw and seed heads to provision nest builders of all kinds. The huge pile, which I add to in every season and call “The Nest Depot”, is itself a cool sheltering place for snakes, toads and the like. At Scully we form similar mounds of organic material behind the greenhouse. We spend an inordinate amount of time and energy just to tidy up the landscapes around our homes, or are we perhaps trying to have some control over nature? Whether we mow, blow, weed-whack or simply scrape a rake it is a selfish act, because in doing so we disrupt Earth’s natural cycles. We displace carbon from our land, prevent natural decay from contributing to the nitrogen cycle and further deplete the soil’s capacity to retain water. Nature recycles, birds and other builders of nests re-purpose and re-use if we let them. I like to think that nothing in these garden stockpiles will go to waste. It is a way of giving back, so that for years to come we can enjoy signs of rebirth and the joys of spring.